The stability and strength of the Arcadia system far surpasses any other cable or glass railings currently on the market. Featuring a clean, minimalistic styling, the Arcadia system is the safest and sturdiest for commercial and high-end residential buildings. 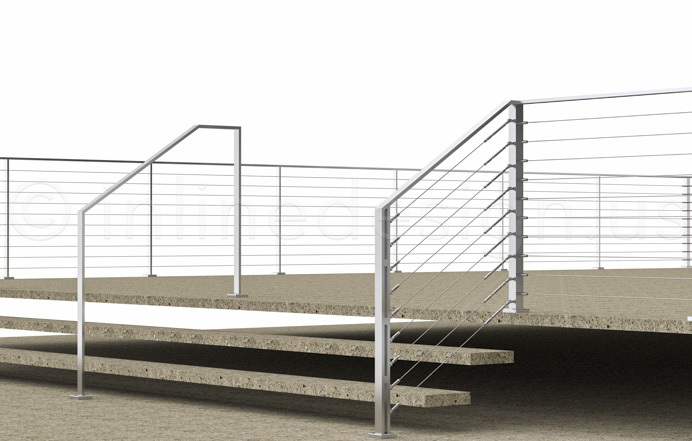 Available in heights of 36 or 42 inches, and in either floor or side mounted options, the railings are forged in solid 1 ¾ x 5/8-inch bars while the end posts, more than double the thickness, help to sustain the pulling force of the cables. Modern, minimalistic, and requiring little effort to install, the Arcadia system is the best and most affordable choice for your home or business.